Another type of writing by Erasmus's appeared in 1516, while he briefly served the future emperor Charles V (1500–1558) as councilor (a person who gives advice). He prepared a guide for educating princes to rule justly, Institutio principis Christiani, and in 1517 composed Querela pacis (The Complaint of Peace), speaking against war as an instrument of oppression (the act of keeping down, or suppressing, by forceful authority) and warning rulers to fulfill their obligation to preserve Christian harmony. 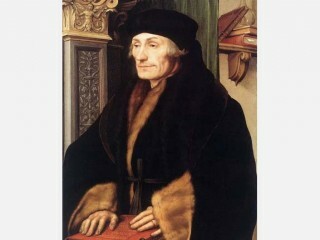 Erasmus thus demonstrated his sensitivity to Europe's approaching split in the Christian Church. View the full website biography of Erasmus.